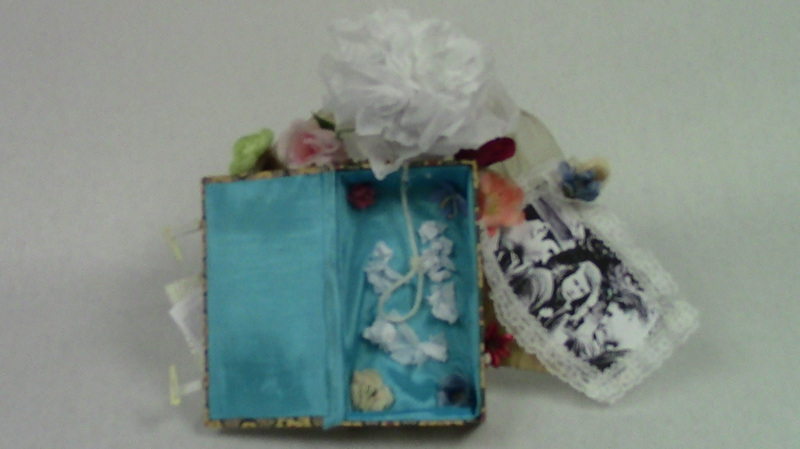 This shadow box is modeled after a memorial for the White Rose, a Nazi resistance organization. As flowers are often used in memorials, there are plenty used, with one large white rose at the top. On the outside, there are two pictures. One is of three members of the White Rose, Sophie Scholl, Hans Scholl, and Alexander Schmorell. The other is a copy of two of the six leaflets the organization wrote to protest the Nazi regime. 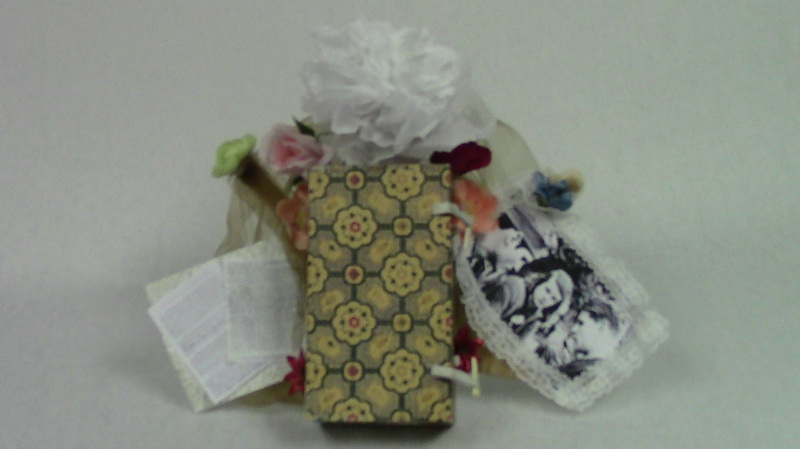 Inside the box there is a noose and tissue paper representing the unfinished seventh paper. This symbolizes the fact that even after the leaders were killed and the group was disbanded, they still had one final say when thousands of copies of the draft of the seventh leaflet were dropped over Germany by the Allies. It was a crisp late-winter day in 1943. Two young students, a brother and sister, hurriedly walked down the street, heads down. Entering the large Munich University building, they opened their briefcases to reveal hundreds of papers. They spread the stacks along the corridors while all the students and professors were in class. As they were about to leave, they realized that they still had many papers left. They left them throughout the upper level and even threw a stack off of the top of the atrium. The bell rang, and though they attempted to get lost in the large crowd of students, they heard a cry from the custodian. Up until this event, the White Rose was a powerful student-led Nazi resistance group. Formed in 1942 by Hans Scholl, Alexander Schmorell, and George Wittenstein, the organization was named in reference to B. Traven’s book by the same name. As it grew, the White Rose was mostly made up of students attending Munich University, though it also included those from Hamburg, Freiburg, Berlin, and Vienna. Scholl had once been a member of Hitler youth, up until 1937 when he was influenced by the German Youth anti-Hitler Movement. Schmorell was forced to be part of the German Labour Service, and later part of the German army. Wittenstein was a medical student in Munich, and after the Holocaust ended and he escaped execution, he wrote a biography about the White Rose. In 1942 Schmorell and Scholl wrote four leaflets protesting Nazi rule. In order to get the word out, they mailed them all over Germany and left them in discreet but public areas where anyone could find them. They also sent them out via couriers, though they were usually female, as it was easier for females to travel throughout the country. After distributing the first wave of leaflets, the group was joined by Hans’ sister Sophie. She would later become a well-known figurehead of the White Rose and have a movie produced about her, but sadly that was after her death. Shortly after Sophie came along, they were joined by Christoph Probst, a married medical student with three children. Probst mostly worked in the background. In the summer of 1942 many members, including Scholl, Wittenstein, and Schmorell were sent to Russia as medical assistants in the field. Horrified by the treatment of Russians and Polish Jews, they had renewed energy to take down the Nazis. When they returned to Munich in November of that year, they were accompanied by Willi Graf, another assistant whom they had met in the field. Shortly after, they were also joined by Professor Kurt Huber, who became an advisor and aide within the White Rose. In January of 1943 the group released over 6,000 copies of their fifth leaflet. Then after the defeat in Stalingrad, in February, they had Huber write up their sixth paper. While he was doing that, other members enacted an extremely dangerous graffiti campaign. They acted at night to minimize risk, and over February 4th, 5th, and 15th hit twenty-nine different locations in the city of Munich. By February 16th the paper was completed and edited, and it was mailed out by the 18th. Perhaps they could have done more, but in the end the group only lasted a year, and the sixth leaflet turned out to be their last. On February 18th, Hans and Sophie Scholl distributed their leaflets throughout the corridors of Munich University. They were seen dropping a pile from the atrium by custodian Jakob Schmid, who turned them in to the police. Hans also had with him an early draft of Probst’s seventh leaflet, leading to the capture of Probst and many other members. The Scholls and Probst were tried and found guilty by the people’s court, and executed the same day. On their way to their deaths, Hans could be heard shouting “Es lebe die Freiheit!” (Long live freedom.) until he spoke no more. Those powerful words were his last. Later Graf, Schmorell, and Huber were tried on April 13th, along with eleven other associates. They too were sentenced to execution; Huber and Schmorell on July 13th, and Graf on October 12th. All of the others were sentenced to jail, save for one unnamed student. Although the leaders were all executed, the White Rose still made one last outcry against Nazi Germany. When the Allies flew over the country, the bombers dropped something over multiple cities. It was not bombs, no- it was millions of copies of the seventh leaflet, which had been smuggled out of the country. Even after the end of the war, the White Rose has become a great symbol for Nazi resistance. Now the White Rose has a memorial outside of Munich University, a stack of leaflets painted on the stones, so their deeds may be remembered by all.